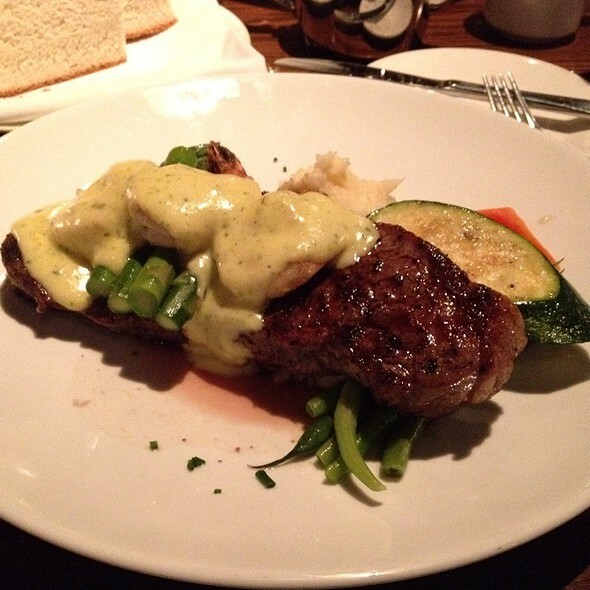 In Vancouver, British Columbia, the Hamilton Street Grill in the Yaletown neighborhood is a contemporary steakhouse. Centrally located to the city�s downtown, Hamilton Street Grill is in a converted warehouse with high ceilings and an elegant oak bar for patrons to sit and enjoy a selection from the extensive wine list. The kitchen features locally grown and raised produce and meats and creates seasonal dishes. Starters at Hamilton Street Grill include gnocchi, chicken livers and steamed mussels in a white wine sauce. There are also raw bar options like oysters. Larger plates include a range of steaks, including 20-oz. strip sirloin, a grilled New York strip and a bacon-wrapped filet mignon. We have a private room for up to 30 people with its own bar. hate to see it close!! will miss my steak dinners! thanks for all the great years!!! Four of us had a great dinner at the Hamilton Grill. Easy walking distance from accommodations as well as the entertainment venue we headed to after dinner. Good choices on the menu and good for those avoiding gluten. Normally I love sitting on the patio but this time the bar next door had a large group on their patio that were very loud and obnoxious and drunk - totally disrupted our dining and pleasure. Server required more training and experience. The food was delicious and the atmosphere was very relaxed. Would go again. Had a very large post rugby game group and they could not have been more accomadating!! Thank you! Brought friends here before a concert and the food, service and ambiance were all great. As always, the Hamilton proved to be a wonderful dining experience. Great steak!! Enjoyed their birthday special and will be back soon! As always, you guys never failed to impress ! Thank you again for the chef that night for the yummy dessert treat! Steak is really good too!!! Our server is really great!!! We took advantage of the birthday special. It was a terrific deal and the food was great! We choose Hamilton Street Grill for a birthday dinner of 8 people. Truth be known it was one of the few restaurants that had an opening large enough for us on a Saturday night when booking on a Wednesday but it was a pleasant surprise. Service was good, attentive but not overbearing and the appetizers were very good, the Bison Carpaccio was quite good, oysters were fresh and the Gnocchi was excellent. The main course special, a taster of chicken, steak and prawns was good, a bit salty, but a good portion, and not overwhelming. Other dinners ordered were well received and their house pasta specialty went over well. Beer selection was a bit light for a city with so much choice but their 'RB' house brand was fine for a few. The Prosecco ordered was a well know brand and suited the dinner well. Only real disappointment was the lack of an espresso machine, as we were still early in the evening when finished. A good dinner in an area that is very busy and has a lot of choices. I would recommend this restaurant as a place to hold in your pocket for that time when every other place that has the 'reputation' is busy and you want to be able to still get a good meal, good service for a fair price. Fabulous service and attention with just the right amount of checking in. Won me over when they gave us new forks after our appies! Saw another waiter at the bar holding glasses to the light to check for cleanliness. Nice. Food was great. You have to try the Gorgonzola fondue - soooo good. Apparently the best pork chop ever according to one of the party and steaks were done almost perfect. Which is better than 90% of places which usually rate "not quite" or "not even close" on the perfect scale. Bring friends and enjoy - good atmosphere for a group of 6, able to talk freely and weren't overpowered by other tables (or glared at by them either)! The short rib pasta is to die for so is the Gorgonzola fondue. I had a large group which arrived slowly. The servers were all friendly but those of us who had already arrived would have preferred to put in our orders sooner. The servers didn't take the meal orders until an hour later. On the other hand, they didn't rush us out which was nice. Overall, a decent place for a large group. I've walked by many times and never went in. The décor didn't really match the food and service for me. It was rather casual (bulky booth) for a $30 plate type of place but it was very comfortable and we enjoyed our evening. The goal was steak, and the result was a fantastic meal with some delicious appetizers. The service stood out the most for me, as the staff were friendly, not too intrusive, and quick with the refills and plate removals. We had a party for 15 and when arrived the restaurant was pretty empty but service overall was very slow. Took awhile to get our drinks and food after ordered. The food and drinks were not good at all. Hamilton Street Grill is always the place I like to ask friends to meet for dinner when I want something special. If its just a group of friends that want nice place and unique or when it's a small gathering of friends that I haven't seen in a while. I always know that the food and the service are terrific at Hamilton Street Grill. Caesar salad dressing was very strong and a little too much making the salad soggy. Excellent garlic prawns. First impression was that we were re-assigned an inferior table, by the manager telling Hostess. (I suspect to fill the front of restaurant). Good value meal for dine-out, poor wine selections for $27 - $30 half litre. Overpriced wine deters me from returnining to any restaurant. The dishes were amazing. Service was great! Anytime we needed something or wanted to make a change we were accommodated. Everyone in my party was satisfied with the overall experience and would like to go again some time. we had a reservation well in advance for a special occasion. All of our party was present but we had to awkwardly crowd at the door as our table wasn't ready. The table setting was terrible and made it difficult for us to talk so we had to walk around. Service was slow and often non existent. We waited for drinks, had to wave down the server several times, our bills were all wrong even though we stayed in the same seats, we had to pour our own wine each time and the manat ory gratuity was not at all deserved. The food was amazing though. Hopefully they get new staff and work on their service so it reaches the level the food deserves. Great ambiance, great food value for dine-out. Very nice wine program, would definitely recommend this restaurant. We were a group of six. We all ordered off of the DineOut menu. We had steaks and pork chops. It was very well prepared and served. Service was excellent. Wine menu, while not cheap, had some reasonable selections. Overall - exceptional. With good service. The wine list was notable but would be nice to add a little more variety. We ate at Hamilton Street Grill for Dine Out Vancouver and we were quite pleased with our choices and the quality of the food. 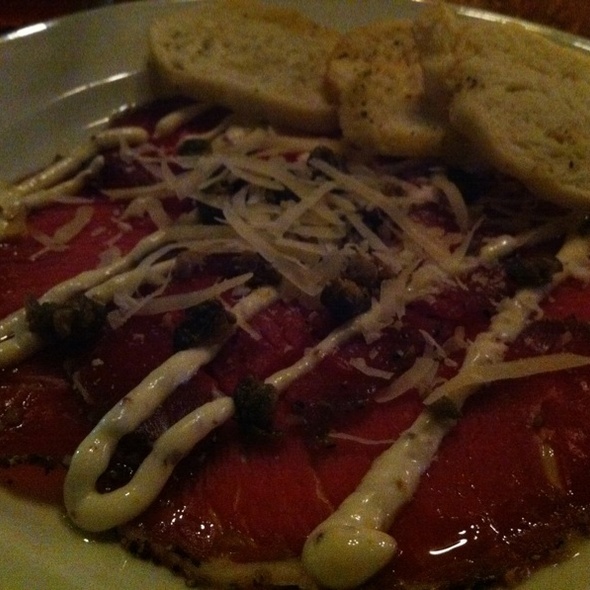 For appetizers, we chose Bison Carpaccio and the Blue Cheese Tart and both were excellent. For our entrees, we chose the NY Steak and the Steelhead Salmon on Risotto and that was so tasty! We never eat dessert, but the Butterscotch Pot de Creme and the Chocolate Cake were just the right size, not too sweet, and we demolished them! We will return - great to discover this restaurant. My girlfriend and I went to Hamilton Street Grill for Dineout 2016. We had a reservation and were promptly seated. We ordered our wine and then reviewed the menu to order our starter and entree. We actually received our starters right away and our wine hadn't even come to the table yet so we were a bit worried that we'd be rushed along. Our wine came a couple of minutes later and we were all set. My girlfriend had the caramelized red onion stilton tart with frisee salad which was actually a wedge slice from a pie versus an individual tart. It was very nice, good flavor and not dominated by the cheese. I had the bison carpaccio with horseradish cream and arugula salad. The carpaccio was delicious however there was a tad too much horseradish cream. We took our time with our starters and our server checked on us regularly to make sure everything was ok.
For entrees we chose the Grilled Angus New York Steak and the Pan Grilled Steelhead. The steak was cooked to perfection (medium rare), the mashed potatoes could have used a bit more garlic and the bok choy was overcooked and limp, the pieces of carrots were fine. The portion of mashed potatoes was sizable and only one small head of bok choy. This dish did not stand out and my girlfriend felt it was a bit bland other than the steak. I had the steelhead and it was cooked nicely. The shrimp and red pepper risotto was also cooked nicely with plenty of shrimp and very flavorful. There were only two choices for dessert so we each chose one of the offerings and decided to share. The choices were gluten free chocolate cake and butterscotch pot de creme. The gluten free chocolate cake was delicious and rich as was the butterscotch pot de creme. The pot de creme came in a small mason jar, and was topped with whip cream - i would have enjoyed more! Other than the veggies and mashed potatoes for my girlfriend's steak we enjoyed our evening and plan to return to try other choices. I have been coming to the Hamilton St.Grill for about 15 years,and it rarely disappoints.The atmosphere is friendly and relaxed and I always feel well taken care of.If only there were a few less expensive wine choices! Not sure why, but they were empty on a Thursday night. Food was ok. It was just too hard to get past the empty room, to try and enjoy the food. Still has the best steaks in town. The ambiance depends so much on who sits at the next table. It could be appropriate for a romantic dinner - the lighting and furnishings are right, but on the evening we went, there were a few kids at nearby tables. It's nice that it's family-friendly for that crowd, but then it's not really a great spot for adults to have their time. It's likely a good place for a group dinner - fare that will please a crowd. Not too trendy or experimental, and quality. Great food, service, and atmosphere! Early seating on New Year's Eve was perfect for us. Two adults and a 9 year old. Would love to see a better kids menu selection as offered by restaurants such as the keg, ie. small steak. Other than that very happy! The waiting time for the food to be served was short even though they were pretty packed, servers were really friendly and food tasted really good. Huge shout out to our lovely server Amelia who made our visit extremely pleasant. The food was absolutely spectacular and the whole evening went like clockwork. There were 15 in our party and Amelia took care of all of us without fail. My bosses were extremely impressed and we will be returning for our Christmas party again next year, and likely sometime in between! Made our double date super romantic! It was a little chaotic because there was a private party happening but can't be helped since we went around Christmas time. Food and service was good. Will go again. Wonderful meal and company, recommended. We went to the Hamilton Street Grill before the game. The food was good but the service was great our server Sarah was friendly, helpful and attentive. The food is always amazing and their staff are incredible. We really enjoyed our meal. A great spot to bring friends and family. We booked a table for 11 people the night after cirque du soleil. It was really busy everywhere in Yaletown and we managed to get an online reso for Friday night. The food was decent, steaks are priced the same as the Keg. Not as good of a selection and still prefer the Keg over Hamilton Street grill. Not my favorite place in Yaletown.